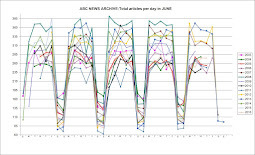 In our initial complaint to the ABC regarding its web presentation "A journey through climate history" we indicated the timeline was "riddled with errors". We provided ABC with a list of 12 items that required attention. ABC subsequently made 7 corrections, but made no changes to sections we considered biased. We suggested that the Timeline undergo a rigorous review to pick up other problems "A thorough audit of the content is required." Here are 30 additional mistakes for ABC to correct. The most telling probably being the confusion between the symbols for Cobalt (Co) and Carbon Dioxide (CO2). In its defective timeline ABC blame Cobalt for ocean acidification, the enhanced greenhouse effect and suggest the world is endeavouring to sequester Cobalt underground. 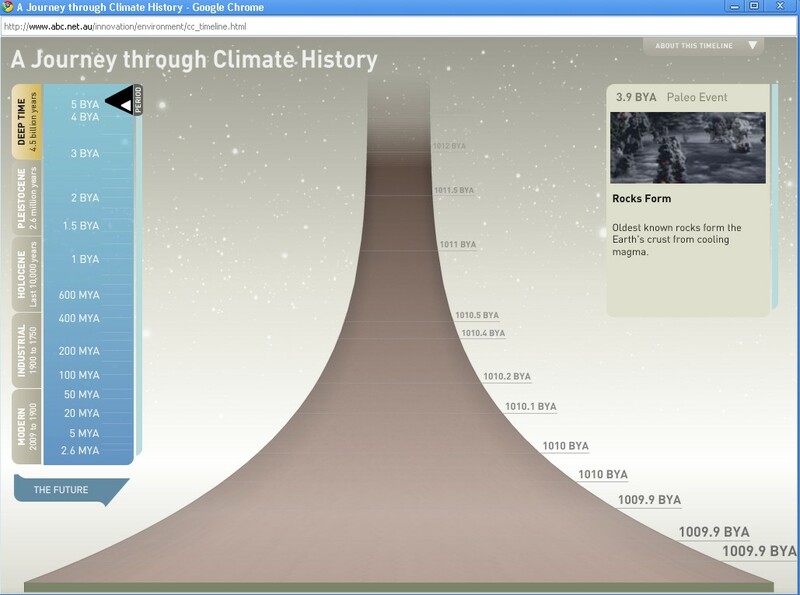 It also seems the Keeling curve is also not a measure of carbon dioxide but of the rare Cobalt compound Co2! There is also confusion between paleoanthropologists and archeologists; confusion between the roles of geology and archeology; confusion between the location of Vostok and Law Dome bases in Antarctica; along with software glitches that reveal an infinitely old universe, and numerous spelling and grammatical mistakes. "Riddled with errors"is an understatement. Under section “Deep Time” it is possible to scroll the timeline over 1000 billion years into the past (screenshot right). Current estimates for the age of the universe are two orders of magnitude less. That is some software glitch. Karoo Ice Age: Inconsistency between statements of causation of glaciers between the Huronian Ice Age and the Karoo Ice Age. Homo Habilis and Homo Ergaster: extraneous “-” in “hand-y man”. Discovered by paleoanthropologists not archeologists. Pleistocene Glaciations: The pattern of temperature, CO2 and methane follow an almost identical pattern, however changes in temperature precede changes in CO2 and methane concentrations by about 1000 years. Carbon dioxide level 1000AD: Readability-“CO2 measure” should read “CO2 measurements”. Also misrepresents location of Law Dome, suggesting it is close to the Vostok Base. Coordinates: Law Dome -66° 44' 0.00", +112° 50' 0.00" Vostok 78°27′51.92″S 106°50′14.38″E. Carbon dioxide level 1250AD: Readability-“CO2 measure” should read “CO2 measurements” Also misrepresents location of Law Dome, suggesting it is close to the Vostok Base. Coordinates: Law Dome -66° 44' 0.00", +112° 50' 0.00" Vostok 78°27′51.92″S 106°50′14.38″E. Carbon dioxide level 1500AD: Readability -“CO2 measure” should read “CO2 measurements”. Also misrepresents location of Law Dome, suggesting it is close to the Vostok Base. Coordinates: Law Dome -66° 44' 0.00", +112° 50' 0.00" Vostok 78°27′51.92″S 106°50′14.38″E. Carbon dioxide level 1750AD: Readability -“CO2 Measure” should read “CO2 measurement”. Also, unnecessary capitalization “Measure”; and misrepresents location of Law Dome, suggesting it is close to the Vostok Base. Coordinates: Law Dome -66° 44' 0.00", +112° 50' 0.00" Vostok 78°27′51.92″S 106°50′14.38″E. Human population is 978 million (1800): shows a photo of Istanbul from 1880-1900 when world population is estimated at 1.65 billion. Carbon dioxide level 1800AD: Readability -“CO2 measure” should read “CO2 measurements”. Also misrepresents location of Law Dome, suggesting it is close to the Vostok Base. Coordinates: Law Dome -66° 44' 0.00", +112° 50' 0.00" Vostok 78°27′51.92″S 106°50′14.38″E. Carbon dioxide level 1850AD: Readability -“CO2 measure” should read “CO2 measurements”. Also misrepresents location of Law Dome, suggesting it is close to the Vostok Base. Coordinates: Law Dome -66° 44' 0.00", +112° 50' 0.00" Vostok 78°27′51.92″S 106°50′14.38″E. Ocean pH level is 8.17: This post indicates that cobalt is responsible for ocean acidification. The incorrect symbol has been used for oxygen in the chemical formula for carbon dioxide “Co2”. Should read CO2. Co is the chemical symbol for Cobalt. Carbon dioxide level 1900AD: Readability -“CO2 measure” should read “CO2 measurements”. Also misrepresents location of Law Dome, suggesting it is close to the Vostok Base. Coordinates: Law Dome -66° 44' 0.00", +112° 50' 0.00" Vostok 78°27′51.92″S 106°50′14.38″E. Nitrogen Fertilizers 1913: Suggests the Habar Bosch process has increased Cobalt levels. The incorrect symbol has been used for oxygen in the chemical formula for carbon dioxide “Co2”. Should read CO2. Co is the chemical symbol for Cobalt. Ocean pH level is 8.15: This post indicates that cobalt is responsible for ocean acidification. The incorrect symbol has been used for oxygen in the chemical formula for carbon dioxide “Co2”. Should read CO2. Co is the chemical symbol for Cobalt. Carbon dioxide level 1950AD: Readability -“CO2 measure” should read “CO2 measurements”. Also misrepresents location of Law Dome, suggesting it is close to the Vostok Base. Coordinates: Law Dome -66° 44' 0.00", +112° 50' 0.00" Vostok 78°27′51.92″S 106°50′14.38″E. 1958 The Keeling Curve: Does not measure atmospheric Cobalt levels. The incorrect symbol has been used for oxygen in the chemical formula for carbon dioxide “Co2”. Should read CO2. Co is the chemical symbol for Cobalt. Ocean pH level is 8.12: This post indicates that cobalt is responsible for ocean acidification. The incorrect symbol has been used for oxygen in the chemical formula for carbon dioxide “Co2”. Should read CO2. Co is the chemical symbol for Cobalt. Human population is 6 billion: Spelling “grown” should read “growth”. World population from 1800 to 1900 grew by about 170%, not 69%. Carbon capture and storage: Implies Cobalt being captured and stored. The incorrect symbol has been used for oxygen in the chemical formula for carbon dioxide “Co2”. Should read CO2. Co is the chemical symbol for Cobalt. Ocean pH level is 8.09: This post indicates that cobalt is responsible for ocean acidification. The incorrect symbol has been used for oxygen in the chemical formula for carbon dioxide “Co2”. Should read CO2. Co is the chemical symbol for Cobalt. The Kyoto Protocal. As far as we know the only organisation that can ratify the treaty is a nation state, use of the word “parties” in this context is not appropriate. The Great Global Warming Swindle: Capitalisation – “channel 4” should read “Channel 4”.